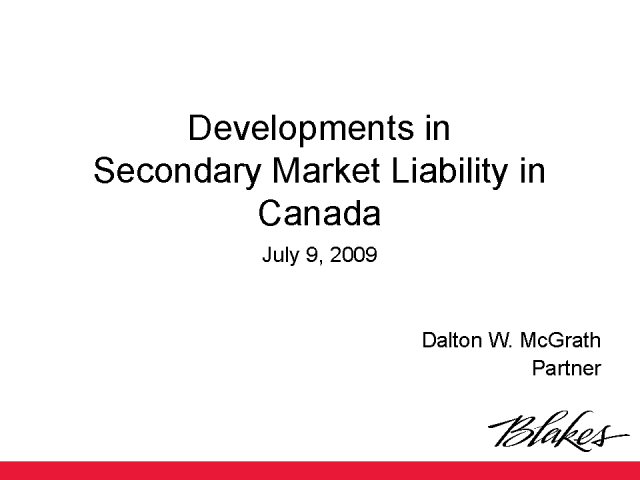 This discussion will involve developments in secondary market liability in Canada including triggers for liability, presumptions of reliance/causation, burden of proof, damages and methods to limit liability. There is a new wave of investing for social and environmental impact, represented by a growing group of social venture funds, that make more sense to more investors now that investing for pure greed has been shown to be bankrupt financially and morally. Companies in this sector are outperforming, because externalities and risks are already factored in. The U.S. Supreme Court's decisions in recent years have had a significant effect on securities class action litigation in the district courts and Courts of Appeals breathing some life into once dead doctrines like "core operations" and "collective scienter." The Supreme Court's decisions have also given loss causation an increased focus at all stages of a securities class action including motions to dismiss, class certification, summary judgment, motions in limine, trial, and even post-trial motions. The credit crisis has raised interesting questions in shareholder derivative suits concerning the duties of boards to manage systemic risk and more broadly raised issues concerning how companies can structure their insurance coverage to withstand the crisis. R. Damian Brew, Managing Director at Marsh USA Inc.
We set the stage with a summary of recent trends in securities litigation arising from the credit crisis - who is being sued, who is suing and what types of cases are there. Next we discuss issues and analyses relevant to causation, materiality, liability and damages in these lawsuits. In particular we focus on event studies in a period of uncertainty and also on assessing materiality in a volatile market. We also discuss considerations relevant to class certification in credit crisis related class actions and touch on the role of hedge funds in credit crisis related litigation. Conducting an internal investigation in the current regulatory and economic environment raises a host of competing and often contradictory concerns and objectives. The webcast will discuss the latest developments regarding DOJ, SEC and FINRA cooperation guidelines, the recent emphasis on sharing "factual" (versus "privileged") information with the government and regulators, and issues relating to employee representation (fee advancement, Upjohn warnings and multiple representations). Ms. Dee will offer strategies for meeting government and regulatory expectations while minimizing costs and litigation risk. Chris will present a European investor view on securities litigation. Chris is a Principal in Mercer’s Mercer Sentinel® Group and consults to European Pension Plans on all aspects of investment operations. Class action recoveries has become a hot topic for pension plans in recent years and the range of approaches taken has expanded over time. Historically European Pension Plans generally ignored litigation and only participated in Class Action recoveries opportunistically when and if alerted by investment managers or their custodian. As a US phenomenon Class Actions were not seen as relevant by many Plans and there was little appreciation of the sums of money involved. More recently the trend has been one of passive participation in recoveries but with an active search for opportunities. Reliance on custodian “best endeavours” has given way to selection of a service provider. Within Pension Plans Governance and Socially Responsible Investing (SRI) considerations are leading to the establishment of litigation and recovery policies and global opportunities are being pursued. Going forward will we see significant growth in active participation? Enron, Parmalat and Shell have raised awareness – its clearly no longer “just obscure US companies” involved – and attacks on financial institutions globally can be expected to whet the appetite further. The activities of US law firms looking for plaintiffs (and fees) have had mixed impacts and the different approaches to litigation, in place or planned, in different jurisdictions complicate the picture. Pension Plans have a fiduciary duty to fulfil and failing to collect monies due to a Plan could be seen as a breach of that duty. However its net returns that count and Trustees need to understand costs as well as potential recoveries. Litigation outside the US Class Action system is much more of a lottery and Trustees remain wary of active participation. Foreign-Cubed Securities Actions: What Are They? Why Are They Important? Are They Here To Stay? The scope of U.S. securities law in global financial markets remains an open and increasingly important question, especially in the post-credit crisis global economy. One interesting line of cases in this arena are the so-called “foreign-cubed” cases in which a US securities class action is filed in a US court against a foreign issuer on behalf of foreign investors who purchased the securities on a foreign exchange. Because Congress has remained silent on such actions, and because there is no Supreme Court precedent regarding foreign-cubed litigation, federal courts have been fertile ground for decisions regarding the propriety of foreign-cubed cases. To date, there has been no consensus among US federal courts as to what specific test or factors to apply in determining whether they have subject matter jurisdiction over foreign cubed cases. This presentation will survey the current case law and explain how the courts are applying jurisdictional tests in foreign-cubed litigation. It also will address the legal precedents upon which the current cases rely and discuss the competing policy interests related to maintaining or declining such extraterritorial jurisdiction. Finally, the discussion will focus on potential future developments in the law of foreign-cubed cases, as well as strategies for a successful securities litigation practice in this area. This presentation, “Hedge Funds and Current Securities Litigation,” will focus on key issues and potential analyses in various types of litigation involving hedge funds. We will begin by providing an informational overview of hedge funds, including a review of defining features and challenges unique to these investment vehicles, as well as the different classifications of hedge funds. We will then provide a brief context on the dramatic growth in both the number of these funds and in their assets under management over the past decade. We will also discuss some of the trends affecting the evolution of the hedge funds industry and setting the stage for new potential developments in regulation, pricing, reporting, and management. We will then examine some of the major concerns that have arisen relative to hedge funds, such as their performance relative to other investments and to their fees, and to the difficulty of measuring performance over time, and will refer to several well-known studies on the controversial topic of “hedge fund alpha.” We will conclude this first part of the presentation by examining the current regulatory environment for hedge funds. Next, we will turn to issues in hedge fund litigation, beginning with a discussion of the complex relationships among key parties – the prime brokers, investors, auditors, and hedge funds, and we “follow the money” through a set of hypothetical trades. The rest of the presentation will take us through a detailed examination of specific kinds of hedge funds cases, including investor-focused litigation (Madoff-related matters), trading and market manipulation, including insider trading, late trading/market timing, conflict of interest cases, and cases involving prime brokers. For each of these examples, we will present potential analytical approaches to assessing issues related to liability and damages. Despite common wisdom, hedge funds are currently regulated under various statutes and have been the subject of lawsuits for alleged failure to conform to these regulations. However, there is little doubt that a series of regulatory and legislative initiatives will result in further restrictions both in the U.S. and abroad. These initatives will deal with effect a broad range of issues including registration, transparancy, risk management, investor relations, derivatives, due diligence, and capital requirement. This presentation will cover existing regulations and legislation that influence hedge funds, as well as provide a review of the resulting litigation. We will also explore the likely future regulatory and legislative initiatives that will most likely change the manner in which hedge funds conduct business and the litigation issues that will dominate the industry in the future, with special emphasis on the likely changes in hedge fund regulation that will result from the Obama administration's financial reform initatives. We will be selecting three live viewers who will receive a free copy of Mr. Acharya's book, "Restoring Financial Stability: How to Repair a Failed System." This channel features the latest regulatory and legal trends and developments in the Financial Services sector.